Wituszynska, W. and Karpiński, S. (2014). Determination of Water Use Efficiency for Arabidopsis thaliana. Bio-protocol 4(3): e1041. DOI: 10.21769/BioProtoc.1041. Wituszynska, W., Slesak, I., Vanderauwera, S., Szechynska-Hebda, M., Kornas, A., Van Der Kelen, K., Muhlenbock, P., Karpinska, B., Mackowski, S., Van Breusegem, F. and Karpinski, S. (2013). Lesion simulating disease1, enhanced disease susceptibility1, and phytoalexin deficient4 conditionally regulate cellular signaling homeostasis, photosynthesis, water use efficiency, and seed yield in Arabidopsis. Plant Physiol 161(4): 1795-1805. Water use efficiency (WUE) is a quantitative measurement of how much biomass or yield is produced per amount of water used. It is an important physiological factor for agriculture, especially in areas with a limited accessibility of water. It is also crucial in a better understanding of drought tolerance and drought resistance. The most common method to measure the WUE of individual plants is to weigh each pot or container to monitor the water loss and to harvest and measure biomass or yield at the end of the experiment. Since water can be lost from the soil surface through evaporation, there is a need to perform WUE measurements in a closed system. 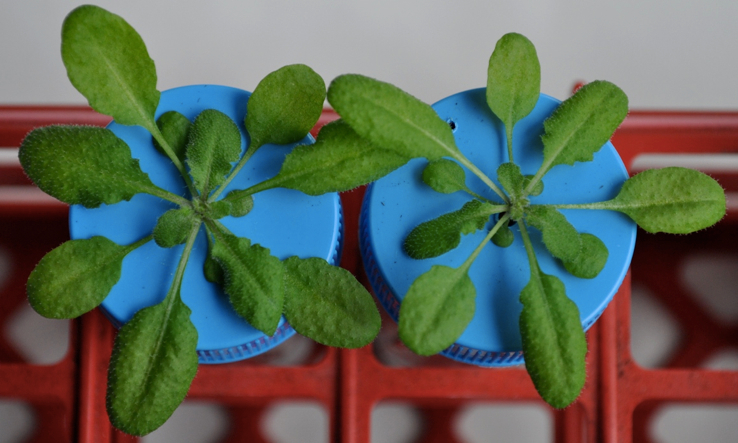 Here, we describe a simple method for WUE determination for Arabidopsis thaliana. In a container, prepare a mixture of soil and perlite in a 1:1 proportion. Fill in 50 ml Falcon tubes with soil-perlite mixture to the 70-80% of Falcon volume. To each Falcon pour out 35 ml of water and wait till the water sinks into soil-perlite mixture. 35 ml is normally sufficient to grow plants to the stage of 4-week-old. In a separate container, moisten soil with water in a 1:1 ratio. Full the Falcon tubes to the brim with well-moistened soil. Using a burner, heat the tweezers and use them to make a hole (1.5 to 2 mm wide) in a central part of the Falcon tube cap. Another hole can be made closer to the cap edge (see Figure 2) in order to supplement the system with water (in case of growing plants longer than 4 weeks). Note: While making a whole, move the tweezers’ end from the upper side of a cap towards the bottom side to avoid protrusion of plastic scraps that could wound the seedling. Turn off each brim-filled Falcon tube with the cap. Wrap Falcon tube with aluminium foil or other non-transparent material to avoid algae growth. In the central hole place 5 to 10 Arabidopsis seeds. Store falcon tubes in 4 °C in a humid environment (for example in a closed transparent container with a water-covered bottom) for two days. After two days, move the whole system (Falcon tubes placed in a transparent water-containing container) to the growing chamber/phytotron. After plants germinate (after about 5-7 days), remove excessive seedlings (using tweezers), leaving only one seedling in a hole (Figure 1). Weigh each falcon tube and write down the falcon weight (g) at the beginning of experiment (W0). Grow plants for 4 weeks in a growing chamber/phytotron. After 4 weeks (Figure 2), decapitate the rosettes and dry them for 3 h at 105 °C. Weigh dry mass for each rosette (mg) (DW). After removal of rosette, weigh each falcon tube and write down the falcon weight (g) at the end of the experiment (W). Calculate the water loss: W0 (g) – W (g) = Water used (g). For water 1 g = 1 ml. Calculate dry weight per unit of water used (mg DW x /ml of water used). Please also cite the following publication when citing this protocol: Wituszyńska et al. (2013). This work was supported by the Welcome/2008/1 Program operated within the framework of the Foundation for Polish Science and co-financed by the European Regional Development Fund. Hello thank you for your article. 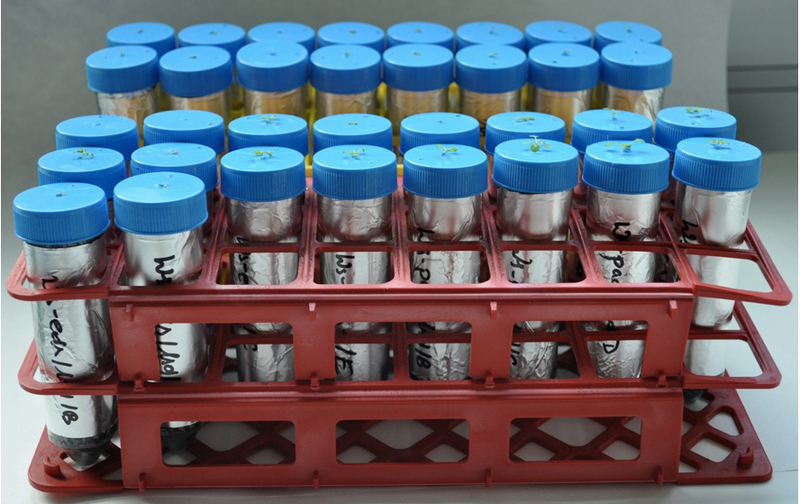 I want to carry out drought stress experiment on Arabidopsis by withholding water. Please guide me.